↑ "Protocol for using New Zealand's National Anthems". Ministry for Culture and Heritage. अभिगमन तिथि 17 February 2008. ↑ New Zealand Government (21 December 2007) International Covenant on Civil and Political Rights Fifth Periodic Report of the Government of New Zealand, पृ॰ 89. (Report). Retrieved 18 November 2015. 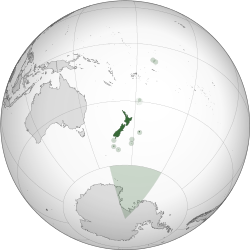 "In addition to the Māori language, New Zealand Sign Language is also an official language of New Zealand. The New Zealand Sign Language Act 2006 permits the use of NZSL in legal proceedings, facilitates competency standards for its interpretation and guides government departments in its promotion and use. English, the medium for teaching and learning in most schools, is a de facto official language by virtue of its widespread use. For these reasons, these three languages have special mention in the New Zealand Curriculum." ↑ "The New Zealand Land Cover Database". New Zealand Land Cover Database 2. Ministry for the Environment. 1 July 2009. अभिगमन तिथि 26 April 2011. ↑ "Population clock". Statistics New Zealand. अभिगमन तिथि 14 April 2016. The population estimate shown is automatically calculated daily at 00:00 UTC and is based on data obtained from the population clock on the date shown in the citation. ↑ अ आ इ ई "New Zealand". International Monetary Fund. अभिगमन तिथि 9 October 2018. ↑ "Income inequality". Statistics New Zealand. अभिगमन तिथि 14 June 2015. ↑ "Human Development Report 2018" (PDF). HDRO (Human Development Report Office) United Nations Development Programme. पृ॰ 22. अभिगमन तिथि 14 September 2018. ↑ "New Zealand Daylight Time Order 2007 (SR 2007/185)" (अंग्रेज़ी में). New Zealand Parliamentary Counsel Office. 6 July 2007. अभिगमन तिथि 6 March 2017.